My absolute FAVOURITE sushi restaurant, is Lighthouse Sushi in Lethbridge, Alberta. It is the ONLY place for amazing sushi in Lethbridge. I go to Lighthouse very often, and sometimes I even get it delivered to me at school (by my parents) for lunch! I even had my 10th Birthday Party at Lighthouse! A few weeks ago I was lucky to have the owner of Lighthouse (Ryan Squire) teach me how to make Spicy Tuna Rolls! It was such an amazing experience!! When cutting sushi, you should always wet your knife so that the rice doesn't stick to the blade. 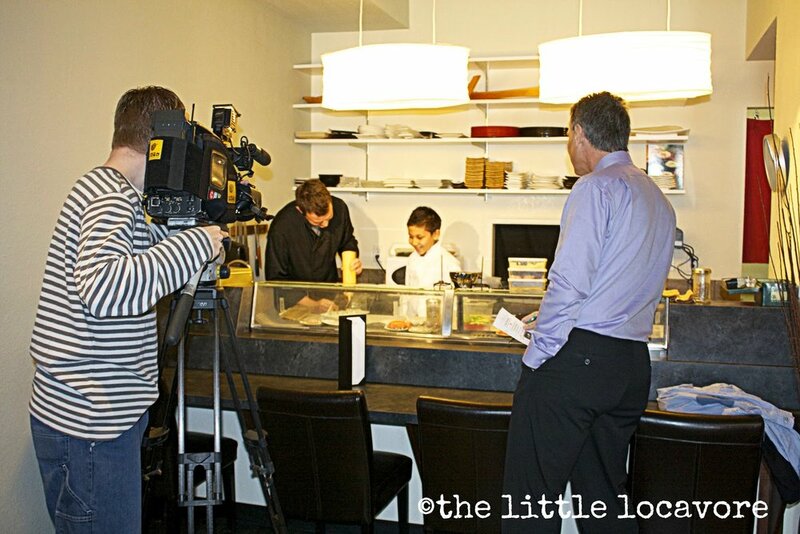 It was also sooo exciting because CTV Lethbridge was there to film my sushi-making experience. I was interviewed by the reporter: Terry Vogt. He was very nice, and talked to me about my blog. The biggest surprise was that Ryan had created a Special Sushi Roll, with my favourite things in it!! It was called the LIAM ROLL, and was featured on the menu at Lighthosue all that week!! They sold 100 orders of it!! Now, you can order the Liam Roll, off the SECRET menu (just ask for Lisa or Ryan, and they will have it made for you)! !